2016 should pan out to be a big year for J’Leon Love. 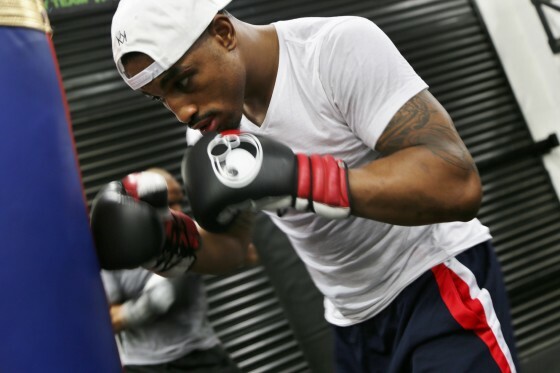 In 2015 Love got his career back on track with three victories, over Scott Sigmon in March, Jason Escalera in June, and Marcus Upshaw in September. Those wins came on the heels of his first career defeat in August of 2014 against Rogelio “Porky” Medina. Love (21-1, 11 KO’s) is ranked #10 by the IBF in the super middleweight division. James DeGale presently holds the belt and an eventual push by Love’s promoter, Mayweather Promotions, towards that title may be in store for the Michigan native. Love is presently back training inside of the Mayweather Boxing Club out here in Las Vegas. Check below for more from Love, as he spars with kickboxing champion and undefeated pro Nieky Holzken, while also putting in some work with trainer Chris Bentchavtchav.